A story in The Malta Independent this morning quotes Nationalist Party sources – no prizes for guessing which, now – as telling the newspaper that 600 people have taken up membership of the Nationalist Party since Adrian Delia became leader, while 20 have left. This is what I call ‘self-soothing thinking’. Ah, Delia’s fervent supporters say, 600 joined! Only 20 left! But if I were in their position, I would be saying: if you chase people to do something and make it easy for them, the chances are they might do it. And if you don’t, they won’t. For the last two weeks, Delia’s supporters have held concentrated membership drives at an unofficial level through party clubs and personal outreach. But nobody has organised any kind of concentrated drive offering to collect people’s party membership cards while hand-delivering resignation letters for signature, which are then immediately whisked away again so that no effort is expended. So any sensible thinker will see that the two situations are not comparable and it is dangerous for the inhabitants of Delia’s echo chamber to read anything into those figures. What they need to do instead is listen to the sentiment outside. Membership figures are telling only when there is a surge in membership which is unprovoked by any calculated membership drive. If you read further down into the story, what should have been the real news peg and headline is right there, buried in the text: during the Panama Papers revelations in 2016, almost 3,000 people joined the Nationalist Party as paid-up members. There was no organised membership drive at the time, so it is clear that this army of people joined the Nationalist Party in reaction to Labour government corruption, and for no other reason at all. Giving their support to the Nationalist Party was the best way they could think of to oppose that corruption. In other words, those 3,000 people did not join the Nationalist Party to support a political football team, or because they liked the leader’s face, but because they wanted to fight the government. 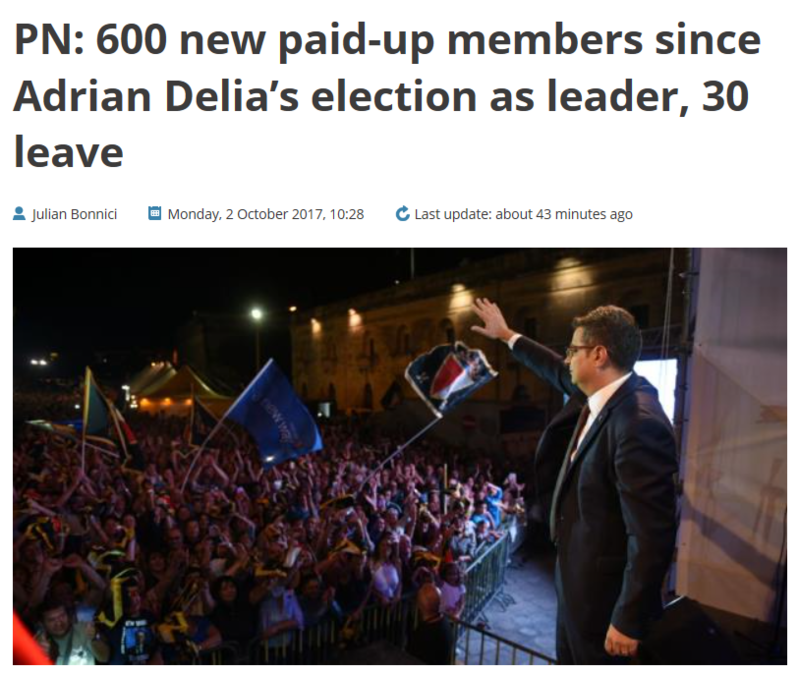 And now we are being told that 600 people joined in the last two weeks because they fancy Adrian Delia, or rather, his chances of “taking our glorious party to victory”, which appears to be the neo-fascist mantra of the day.